I was three miles into a long slow Sunday run along the Lee Valley towpath, pacing out neck and neck with another runner and consequently going faster than I’d intended, when I started to think about the etiquette of passing other runners. To give this some context, I was taking a steady pace along the towpath at the start of a 15-mile run. After the second mile I passed the Lee Valley Rowing Club, catching up with a runner who appeared to be plodding along. However, upon spotting me approaching, he put on a burst of speed to stay about 10 metres ahead of me. This continued for about a mile – despite the other runner having to jump over an ankle-nipper of a dog that had been let off the lead – until he had to stop to do up his shoelace. Although I passed him, a few seconds later I heard the other guy pushing it to catch back up with me. We stayed neck and neck for a minute or two – at which point I was thinking that keeping this going could be useful if it forced me up to tempo pace – but at that point the other runner fell back and quickly vanished into the distance. All of this without a word exchanged. I often use other runners to spur on my pace – spotting someone ahead and eating away at the distance between us and eventually passing them – and occasionally get into small pace skirmishes with other runners. (A few weeks ago, running up Stamford Hill, I could hear another runner a few paces behind me, which really pushed me on to reach the summit first.) However, this was the first time I’ve run so far pacing it out with a random. So, what is the etiquette when you’re racing it out with other runners? Is this purely a male machismo thing, or something common to runners who take pace seriously? How long do you need to be running neck and neck before you acknowledge each other (and I suspect this differs between London and the rest of the country – in the capital runners, like tube passengers, try to avoid eye contact)? I had the exact same scenerio happen to me a couple weeks back during a recovery run… I was maintaining 8:15/ 8:30 pace, passed a guy going the opposite direction about 1200 metres ahead, turned around going the same direction, caught him (still running 8:30 miles) and the guy speeds up to 7:00 mm the second he knows I am near and would not let me pass… I told him he was an idiot too the moment he stopped since he F’ed up my recovery room. I kind of suspect this is a male phenomenon. I have no real reason for assuming this, but it just seems likely. Anyone going to prove me wrong? I’ve had this experience several times in University Parks. Never yet been overtaken, you’ll be astonished to hear. Well – once a bloke overtook me (comfortably), then stopped. I reckon he was doing interval training (is that what you call it?) so his brief overtake didn’t count. Then on another occasion a female caught up with me – and could have blatantly overtaken – except that she started up a conversation. Which she conducted much more comfortably than I did, sadly. I let her do the talking. Many a time I’ve upped my pace to stay ahead. Good for training but somehow… weird. A similar phenomenon happens during lane practice in swimming pools, btw. Its definitely a guy thing to try and keep pace with faster runners. If you are smart you will soon realise that you are running too quickly, move over to the left of the path and wave them through with flick of the right hand. Stay focussed on your particular pace. 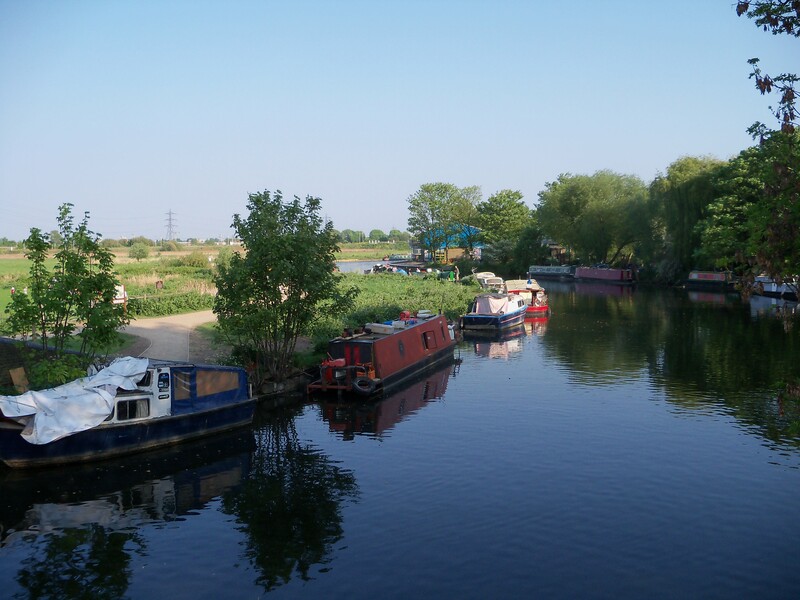 We must live really near to one another – I am in Hackney, near Victoria Park – and I know exactly what you are talking about in the River Lee. Brilliant post, well observed which really made me laugh out loud!